Looks great, Michael. I feel your pain, as I had many similar fit issues with my Judy nightfighter project 13 years ago. Looking forward to part 2! 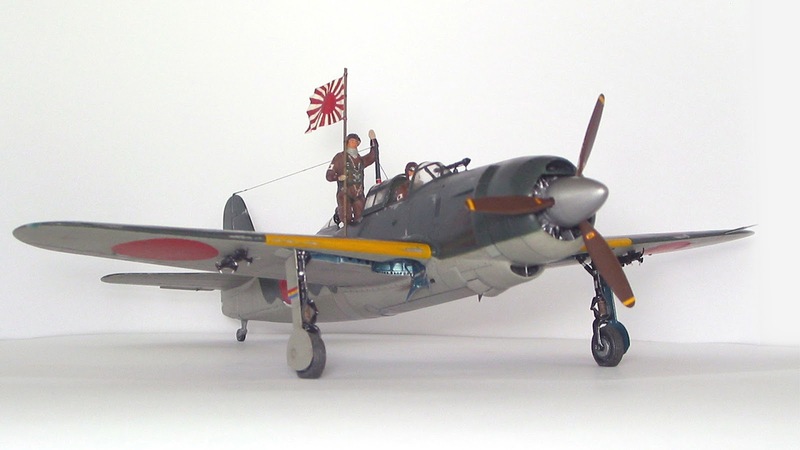 The Suisei or Judy is to me personally a very hard to categorize aircraft. Not technical or something like this, but in my mind. Some aircraft are truly appealing, but mostly a types combat/technical history is what attracts me to it. While I delve into an aircraft type, I more often than not notice how I become more and more attracted to it while doing so, even though it maybe didn't quite meet my taste initially. Beauty equals interesting for me, so to say. The Suisei though is a hard one. I enjoy the general looks of the D4Y1/2, but some features are very strange looking at the same time. For example, the frontal canopy framing forming the small triangle below the sighting telescope is one of the main features I dislike. So the night fighters with their different style of frontal canopy should fix this for me, right? They do, but about them I dislike the far protruding 20mm canon and the metal rear cockpit (I know of the glass one). The radial engine versions aren't beautiful either, as the lower radiator intake disturbs my view massively and destroys the general outline of the aircraft thereby. So while this may sound very picky, I earlier stated most of the time I get attracted by a types history. This in fact is my main problem here. There is no comprehensive literature on this type I know of in English language. Nor do I know how well covered it is even in Japanese. Wouldn't have minded the Dainippon Kaiga book to be at least partially in English. Maybe someone else will look after this topic in the future. Still I'm really eager to learn about the Suisei and enjoy her outlines. Maybe even more so, as she is a small mystery to me. Now finally focusing on your Model. First of all I want to state, despite I said I don't quite like the looks of the D4Y3/4, this doesn't diminish the quality of your build in any way! I enjoy looking at it. You managed the struggle with the kit well. Also your additions are quite worthwhile. Resin radials are always so nice to look at. Two questions remain. Why didn't you show the drop tanks attached? While I was talking about disturbed outlines earlier, I really enjoy them and think they are quite rare to see on this seldom modeled aircraft. Speaking of, yes, the Zero is comparably overrepresented. But so are the Spitfire, P-51 and Bf-109. Contrarily to your perception I think late war aircraft like the Shiden are more known among aircraft enthusiasts than earlier birds. The second question concerns the FineMolds pitot tubes. Are they hollowed on the tip? I'm really looking forward to part II. I enjoy your thoughts and admit that I have similar feelings when I dive into a model's technical and historical background. The more often I look at an aircraft the more beauty I see. I believe it is important to understand the constructor's ideas and constraints. The D4Y3, for instance, appears in fact perfectly streamlined when you look at how smartly the oil cooler was placed under the fuselage to compensate for the smaller radial engine. Only the dropping belly of the cowling somewhat disturbs the profile. Another appealing feature is the great flow of the canopy when closed. Regarding my model, drop tanks will appear in part two, and they do look good on this plane! The Fine Molds pitot tube is not hollow. The tip is needle-thin, so no bore could be applied. It is however a great relief to know that it will not break when you accidentally touch it!